A way of doing approximate inference for probabilistic models with potentially billions of data ... need I say more? Oh ... I do need to say more ... because these three are at it as well but from the sampling perspective. Probabilistic models for big data ... an idea so important it needed to be in the list twice. This paper represents the rise in probabilistic numerics, I could also have chosen papers by Osborne, Hennig or others. There are too many papers out there already. Definitely an exciting area, be it optimisation, integration, differential equations. I chose this paper because it seems to have blown the field open to a wider audience, focussing as it did on deep learning as an application, so it let's me capture both an area of developing interest and an area that hits the national news. One of the great things about ML is how we have different (and competing) philosophies operating under the same roof. But because we still talk to each other (and sometimes even listen to each other) these ideas can merge to create new and interesting things. Kernel Bayes Rule makes the list. An obvious choice, but you don't leave the Beatles off lists of great bands just because they are an obvious choice. In episode 10 of season 4 we chat about Counterfactual Explanations without Opening the Black Box: Automated Decisions and the GDPR, take a listener question about how reviews of papers work at NIPS and we hear from Sven Strohband, CTO of Khosla Ventures. For more reading we recommend Machine Learning Yearning, Talking Nets, The Mechanical Mind in History, and Colossus. In episode five of season four we talk about the GDPR or as we like to think of it Good Data Practice Rules. (If you actually read it, you move to expert level!) We take a listener question about the power of approximate inference, and we hear from our guest Andrew Blake of The Alan Turing Institute. In episode four of season four we talk more about natural an artificial intelligences and thinking about diversity in systems. Reading Can a Biologist Fix a Radio is a great paper around these ideas. We take a listener question about moving into machine learning after having advanced training in a different program. Our guest on this episode is our second second time guest Peter Donnelly, Professor of Statistical Science at the University of Oxford, Director of the Wellcome Trust Center for Human Genetics and a Fellow of the Royal Society. In episode two of season four we're proud to bring you the second annual "Hosts of Talking Machine's Episode"! Ryan and Neil chat about Ali Rahimi's speech at NIPS-17, Kate Crawford's talk The Trouble with Bias, and much more. In episode ten of season three we talk about the rate of change (prompted by Tim Harford), take a listener question about the power of kernels, and talk with Peter Donnelly in his capacity with the Royal Society's Machine Learning Working Group about the work they've done on the public's views on AI and ML. In episode nine of season three we chat about the difference between models and algorithms, take a listener question about summer schools and learning in person as opposed to learning digitally, and we chat with John Quinn of the United Nations Global Pulse lab in Kampala, Uganda and Makerere University's Artificial Intelligence Research group. For a great place to get started with foundational ideas in ML, take a look at Andrew Ng’s course on Coursera. Then check out Daphne Kohler’s course. Talking Machines is now working with Midroll to source and organize sponsors for our show. In order find sponsors who are a good fit for us, and of worth to you, we’re surveying our listeners. If you’d like to help us get a better idea of who makes up the Talking Machines community take the survey at http://podsurvey.com/MACHINES. In episode seventeen of season two we get an introduction to Min Hashing, talk with Frank Wood the creator of ANGLICAN, about probabilistic programming and his new company, INVREA, and take a listener question about how to choose an architecture when using a neural network. In episode fourteen of season two, we talk about Perturb-and-MAP, we take a listener question about classic artificial intelligence ideas being used in modern machine learning, plus we talk with Jake Abernethy of the University of Michigan about municipal data and his work on the Flint water crisis. Recently Professor David MacKay passed away. We’ll spend this episode talking about his extensive body of work and its impacts. We’ll also talk with Philipp Hennig, a research group leader at the Max Planck Institute for Intelligent Systems, who trained in Professor MacKay’s group (with Ryan). Episode seven of season two is a little different than our usual episodes, Ryan and Katherine just returned from a conference where they got to talk with Neil Lawrence of the University of Sheffield about some of the larger issues surrounding machine learning and society. They discuss anthropomorphic intelligence, data ownership, and the ability to empathize. The entire episode is given over to this conversation in hopes that it will spur more discussion of these important issues as the field continues to grow. In episode five of Season two Ryan walks us through variational inference, we put some listener questions about Go and how to play it to Andy Okun, president of the American Go Association (who is in Seoul South Korea watching the Lee Sedol/AlphaGo games). Plus we hear from Suchi Saria of Johns Hopkins about applying machine learning to understanding health care data. In episode twenty four we talk with Ben Vigoda about his work in probabilistic programming (everything from his thesis, to his new company) Ryan talks about Tensor Flow and Autograd for Torch, some open source tools that have been recently releases. Plus we talk a listener question about the biggest thing in machine learning this year. This is the last episode in season one. We want to thanks all our wonderful listeners for supporting the show, asking us questions, and making season two possible! We’ll be back in early January with the beginning of season two! In episode 23 we talk with David Mimno of Cornell University about his work in the digital humanities (and explore what machine learning can tell us about lady zombie ghosts and huge bodies of literature) Ryan introduces us to probabilistic programming and we take a listener question about knowledge transfer between math and machine learning. In episode twenty two we talk with Adam Kalai of Microsoft Research New England about his work using crowdsourcing in Machine Learning, the language made of shapes of words, and New England Machine Learning Day. We take a look at the workshops being presented at NIPS this year, and we take a listener question about changing the number of features your data has. In episode twenty one we talk with Quaid Morris of the University of Toronto, who is using machine learning to find a better way to treat cancers. Ryan introduces us to expectation maximization and we take a listener question about how to master machine learning. In episode nineteen we chat with Hugo Larochelle about his work on unsupervised learning, the International Conference on Learning Representations (ICLR), and his teaching style. His Youtube courses are not to be missed, and his twitter feed @Hugo_Larochelle is a great source for paper reviews. Ryan introduces us to autoencoders (for more, turn to the work of Richard Zemel) plus we tackle the question of what is standing in the way of strong AI. 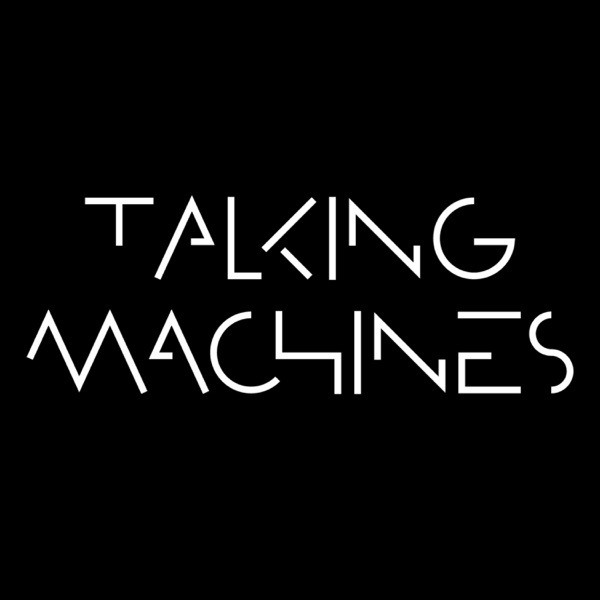 Talking Machines is beginning development of season two! We need your help! Donate now on Kickstarter. In episode eighteen we talk with Sham Kakade, of Microsoft Research New England, about his expansive work which touches on everything from neuroscience to theoretical machine learning. Ryan introduces us to active learning (great tutorial here) and we take a question on evolutionary algorithms. Today we're announcing that season two of Talking Machines is moving into development, but we need your help! In order to raise funds, we've opened the show up to sponsorship and started a Kickstarter and we've got some great nerd cred prizes to thank you with. But more than just getting you a totally sweet mug your donation will fuel journalism about the reality of scientific research, something that is unfortunately hard to find. Lend a hand if you can! In episode sixteen we chat with Danny Tarlow of Microsoft Research Cambridge (in the UK not MA). Danny (along with Chris Maddison and Tom Minka) won best paper at NIPS 2014 for his paper A* Sampling. We talk with him about his work in applying machine learning to sports and politics. Plus we take a listener question on making real time predictions using machine learning, and we demystify backpropagation. You can use Torch, Theano or Autograd to explore backprop more. In episode fifteen we talk with Max Welling, of the University of Amsterdam and University of California Irvine. We talk with him about his work with extremely large data and big business and machine learning. Max was program co-chair for NIPS in 2013 when Mark Zuckerberg visited the conference, an event which Max wrote very thoughtfully about. We also take a listener question about the relationship between machine learning and artificial intelligence. Plus, we get an introduction to change point detection. For more on change point detection check out the work of Paul Fearnhead of Lancaster University. Ryan also has a paper on the topic from way back when. In episode fourteen we talk with Nando de Freitas. He’s a professor of Computer Science at the University of Oxford and a senior staff research scientist Google DeepMind. Right now he’s focusing on solving intelligence. (No biggie) Ryan introduces us to anchor words and how they can help us expand our ability to explore topic models. Plus, we take a question about the fundamentals of tackling a problem with machine learning. In episode thirteen we talk with Claudia Perlich, Chief Scientist at Dstillery. We talk about her work using machine learning in digital advertising and her approach to data in competitions. We take a look at information leakage in competitions after ImageNet Challenge this year. The New York Times covered the events, and Neil Lawrence has been writing thoughtfully about it and its impact. Plus, we take a listener question about trends in data size. In episode twelve we talk with Andrew Ng, Chief Scientist at Baidu, about how speech recognition is going to explode the way we use mobile devices and his approach to working on the problem. We also discuss why we need to prepare for the economic impacts of machine learning. We’re introduced to Random Features for Large-Scale Kernel Machines, and talk about how using this twist on the Kernel trick can help you dig into big data. Plus, we take a listener question about the size of computing power in machine learning. In episode eleven we chat with Neil Lawrence from the University of Sheffield. We talk about the problems of privacy in the age of machine learning, the responsibilities that come with using ML tools and making data more open. We learn about the Markov decision process (and what happens when you use it in the real world and it becomes a partially observable Markov decision process) and take a listener question about finding insights into features in the black boxes of deep learning.